Even with cremation rates and scattering ceremonies in the U.S. climbing, many families still want to honor their loved ones in a permanent resting place. This includes burial options for deceased bodies and cremated remains. A cemetery offers a peaceful environment where relatives and friends can go to remember and feel connected to a special person. As with funerals, a traditional burial offers options and, therefore, some decisions need to be made. If the cemetery itself is not predetermined, factors to consider include location, cost, maintenance and how the graves are marked. It’s important to ask a cemetery representative about the care of the grounds and their policies about upright monuments or flat markers, flower placement, and other rules or regulations. Single-depth burial space – contains one person. Double-depth burial space – contains two persons. At ground level, the space appears to be the same as a single space, but the grave is deeper than normal. The second person’s casket is placed on top of the first. Family lot – multiple spaces grouped together. Lawn crypt – similar to a traditional burial space, but with a concrete grave liner already in the ground to hold and protect the casket. Mausoleum – a building designed for above-ground placement of one or more caskets. Caskets are typically made of either wood or metal. Costs vary greatly and range from simple to very elaborate. There are many options to accommodate each family’s wishes. 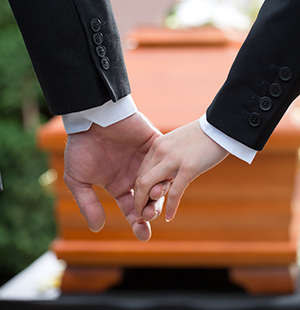 When meeting with a funeral director, they typically have a few caskets available for viewing and many others for you to view in photos and online. Many cemeteries require an outer burial container be placed around the buried casket. This structure, usually made of concrete or metal, helps support the weight of the grave and the equipment used to maintain the cemetery. It also helps protect the integrity of the casket and can help keep the grave level. More information on funeral options is available in the Facts About Funerals brochure produced by the Texas Funeral Service Commission. The professionals at Local Cremation and Funerals are available to help advise you on the burial options available in the Dallas and Fort Worth area including the Dallas-Fort Worth National Cemetery located in Dallas.